Last month a got a call from FleetCarma asking if was interested in trying one of their products and commenting about it. They told me they saw the information I’ve been posting in this blog and thought I would probably like to use their on-board monitoring application and be able to provide good feedback. When I saw the kind of information I would be able to get with their product, I didn’t think twice before jumping on it. 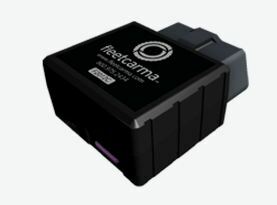 FleetCarma makes an EV Performance Monitoring Solution that combines a data logger connected to the On-Board Diagnostics (OBD-II) port of the Leaf and a web portal where you can upload the collected data and create performance and monitoring reports. It is primarily meant to be used by fleets but it can also be used by individual drivers like me, interested in monitoring cost and performance. The data logger (called C5 logger) stays connected to the car basically all the time, collecting details about charging, driving, temperature and energy used. Like the SOC-meter, it is capable of decoding the exact state of charge of the Leaf to use in its reports, which gives much better precision than what I’m using right now (the 120V charging time). The C5 logger collects and saves all telemetry on a 2GB microSD card, which is large enough to store months or possibly years of data. Every time you get a chance – I do it every few days, you unplug the C5 Logger, remove the microSD card and connect it to a computer using a standard microSD card reader. Then log on the web portal and upload all the data files in it. This will cause all reports to be updated automatically. The more frequent you upload the data, the more up-to-date the reports will be. The main report is a dashboard showing the overall measurements collected and accumulated by the C5 Logger over time. By default, the report covers all the days you used the C5 Logger in the car, but you can also specify start and end dates. The dashboard has several “widgets” that show different measurements, and tabs that show more detailed information. We’ll look at each one of the widgets separately and analyze some of the most interesting data along the way, before digging into the report tabs. 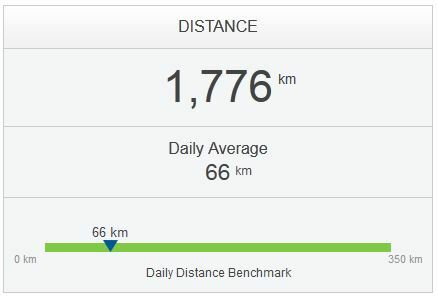 The distance widget shows the total and daily average distances driven throughout the monitoring period. I just noticed that my daily average (66 Km) is almost twice my regular commute to work (34 Km). That means commuting is only half of what we use the Leaf for. Driving energy shows the “MPG-equivalent” measured during the period, but in metrics (liters per 100 km). I don’t mind MPGe but “km per kWh” would also be a meaningful measurement to show (5.7 km/kWh in our case). 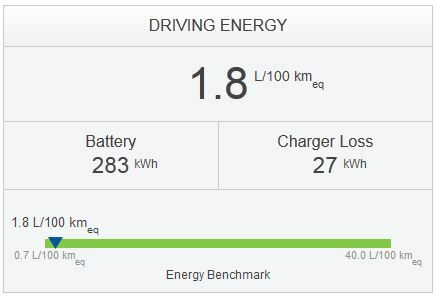 This widget also shows the total energy supplied by the battery while driving (283 kWh) and how much energy was lost during the charging process (27 kWh). That basically means 8.7% of the electricity we spend on the Leaf gets lost in the charger. Something for my to-do list: compare these values with the ones measured by my kWh-meter to see how accurate they really are. 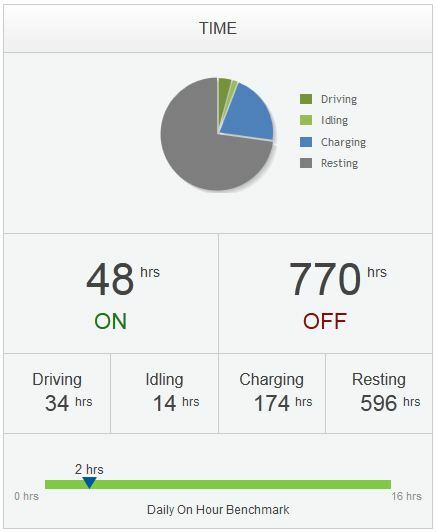 The time widget shows a pie chart comparing how much time the Leaf spent running, idling, charging and, well, resting. You can immediately see that almost ¾ of the time the Leaf is basically parked doing nothing. The remaining time is mostly spent charging (21%) and only 6% of the time is actually spent driving. The relatively high charge-to-drive ratio is due to the slow 3.3 kW Level 2 charger of the Leaf, which doesn’t take advantage of the 6.6 kW charging station we have, and also by the fact that about 30% of my charge comes from Level one at work (next widget). Charging Energy shows how much I charged in total and how much of that charge came from a level 2 charger (71%, mostly at home) and from a level 1 (29%, mostly at work). This is new information for me, something I was never able to collect by any other means. I only had a rough idea of how much charging I was doing at work and how much that would cost to my employer. Now I know exactly! And as I always suspected, it’s not that much: about $2.50 a week on average. It also shows that the Leaf typically starts the day charged at 80% and ends the day with 50% of charge left on average (though this average has a very high variance, not seen here). The Green House Gas Emissions widget is based on configurable options specified in terms of upstream emissions factors for electricity. I’m using a value of 50 g/kWh based on the mix electricity sources used by Hydro Ottawa during off-peak hours (mostly nuclear and hydro), plus a bit more to reflect some of the charging I do during the day at work. I’m not sure if that’s the most appropriate value to use. If anyone has a better suggestion, please let me know. The dashboard is a great summary but the most useful reports are behind the other tabs. 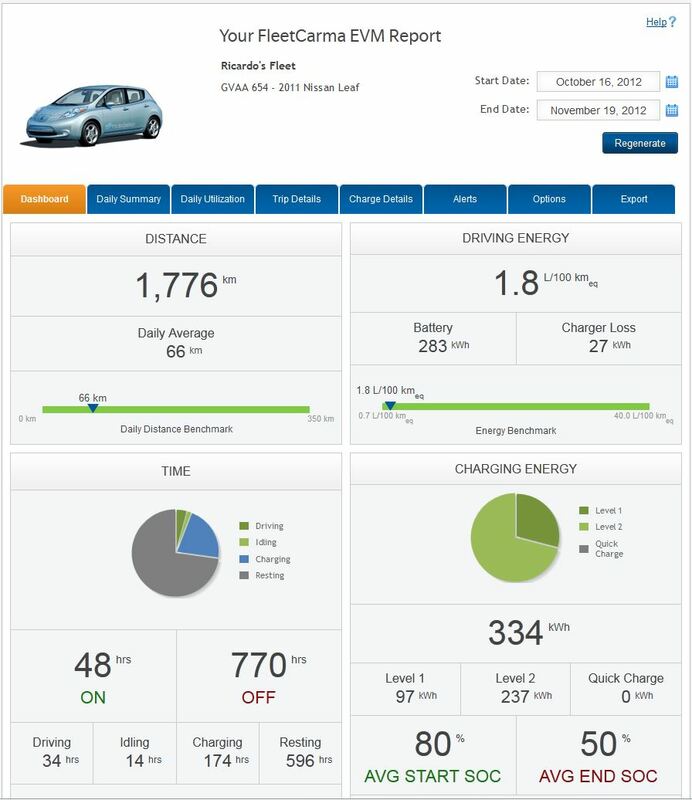 Daily Summary gives a very good idea of how my actual driving needs fit within the range the Leaf can provide. The dark blue bar shows how much range I can get with the overnight charge at home (remember I’m charging to 80%). The additional light blue bar shows the extra range I get for charging during the day. The red mark shows how much I actually drove that day. This chart is great! It also shows the average outside temperature measured for each day as well as the energy consumed by the 12 V accessories and an “Eco Score” that rates the efficiency of my driving. 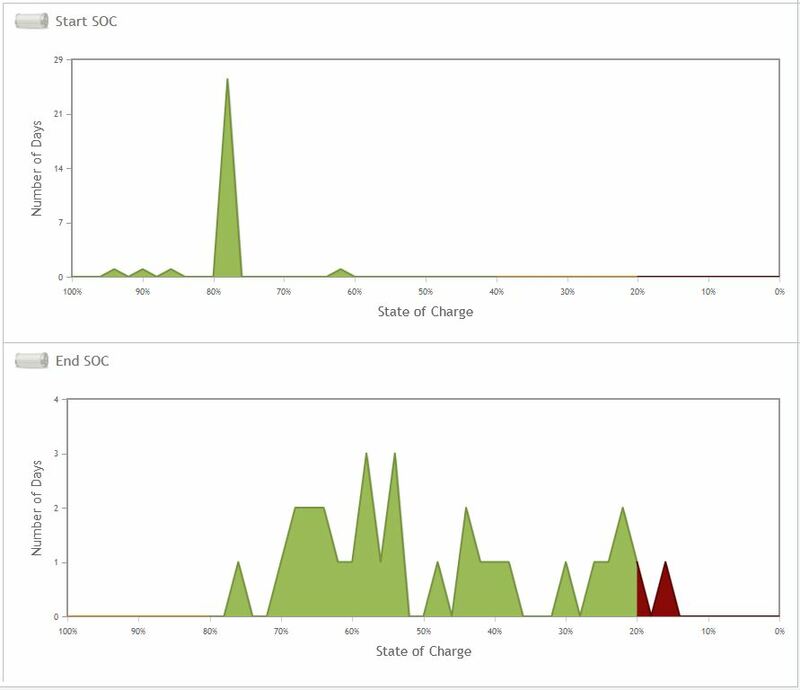 The Daily Summary also includes an histogram showing the state of charge distribution in the beginning and at the end of the day. You can see that the great majority of my days start with an 80% charge, and end all over the place but very rarely below 20%, and never below 15% ! Not much range anxiety for me. Notice that I configure the on board timer of the Leaf to charge only after midnight, even though the off-peak rates start at 7pm. This is because electricity demand is still fairly high early in the evening, and thermal generation is still going strong at that time. I prefer to charge later at night when demand is very low, and when the electricity is much, much cleaner. Trip Details show the start time and duration of each trip, as well as distance travelled, state of charge (SOC) at the beginning and at the end, and the energy consumed. Notice the SOC because this is something you’ll never see on the Leaf display (at least until 2013 J). I’m still puzzled with the first to trips in this report (Nov 17). They covered about the same distance (~12 km) and used the same energy (~2 kWh), nevertheless the SOC dropped much more significantly at the second trip, by almost 12 points compared to 9 points. The main difference between the two trips was the duration, where one took almost twice as long. I suspect that might have to do with a visit to the car wash during the second trip. I regenerated the report just for that day and it showed as much “idling” as driving during that day. The mean temperature that day was 0.6C so I’m not sure if I had climate control on but I was certainly using the heated seat and steering wheel. The extra energy definitely showed up in the SOC but not in Electrical Energy Consumed column! Charge Details show all charging events for both Level 1 and Level 2 charges (and Level 3 as well, if I had ever charged with the DCQC port…). Details also include charging time and duration, charge energy and loss, and the state of charge in the beginning and the end. I noticed a small glitch though, which may be specific for the Leaf. If you have the onboard charging timer configured and you plug in outside the configured charging time, you’ll see a Level 1 event of 0.0 kW, even if you plug in a Level 2 charger. Something similar happen when you unplug a Level 2 charger after charging is complete. This can be seen in the entry #6 above. Both Trip and Charge Details data can be copy-and-pasted into a spreadsheet for more detailed analysis. In Excel, you have to do a “Paste Special” and select “Paste as Text” in order to parse the tab-separated columns properly. You can also import the Excel file created in IBM Cognos Insight for even deeper analysis. How does it compare with Carwings so far? Leaf owners familiar with Carwings will notice that FleetCarma provides much more information and more detailed and useful reports. One thing that particularly called my attention is that FleetCarma also provides more precise and accurate information compared to Carwings. Here’s an example: I ran a quick test by picking one day (Nov 18) and comparing the measurements provided by Carwings and FleetCarm. The number of trips and the travel time are basically the same, but the 2% discrepancy in the distance travelled is a bit puzzling. I know for a fact that the distance measured by FleetCarma is very precise because measurements of my daily commute are always bang on with the trip odometer. For some reason, Carwings underestimated the distance travelled by more than 2%. The biggest difference however is in the measurement of electricity consumption. Carwings seems much more conservative while FleetCarma precisely tells the consumption of each trip, which I tend to trust a bit more based on the before and after SOC observed. But the difference is quite alarming: about 3 kWh or 22% lower for Carwings. This makes the energy economy reported by Carwings about 1 km per kWh higher, or almost 20% better than what it actually is! Streamline the upload process. Maybe a downloadable app for the computer that detects the SD card, uploads all the .BIN files and deletes the LOGS directory (after making a backup on the hard disk). Today these are all manual steps. Add Wifi support to the C5 Logger so that it can upload all the files automatically once car is parked at home. No more SD cards, no more computers, and very up-to-date reports online. Wifi can also be used to connect to an iPhone/Android phone in the car by enabling Personal Hotspot on the iPhone and have the C5 Logger connect to the Wifi network. This will allow an iPhone app to communicate with the logger and receive telemetry in real time. The app could also communicate via Bluetooth, if the hardware is available, but if Wifi is already there, you can use it instead. Add a small display on the C5 Logger to show the current SOC%. Great for 2011 and 2012 Leafs, makes Logger dub as an SOC-meter. Add “km/kWh” to Driving Energy widget on dashboard. 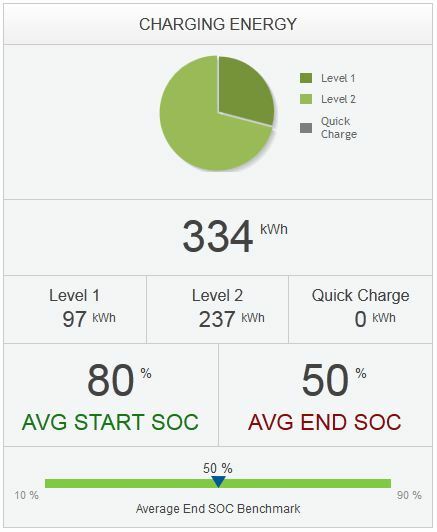 Clarify that “avg start SOC” and “avg end SOC” on the Charging Energy widget refer to beginning and end of the day, not of each trip or charging session. Add temperature column to trip details. This will help in monitoring performance vs. temperature more accurately. Filter out charging sessions of 0.0 kWh charge. These seem to happen when you plug in the Leaf with the charging timer active but before it is time to charge. Add an option to export everything to a .csv file. Include all collected data since the last export. This way we can analyze performance using third-party analytics tools (e.g., IBM Cognos Insight). Create a service API that third-party apps can use to report on the monitoring data. Add a “favorite” widget right after the login page, so I can jump directly to my car dashboard or to a specific report. Location awareness. Not sure if GPS data is available through the OBD-port. If it is, it would open a great door of posibilites. In summary, a great product and lots of potential to evolve and become a killer app for EVs! Update: C5 Logger Spec Sheet says WiFi/Bluetooth support is already in the works (Fall 2012). 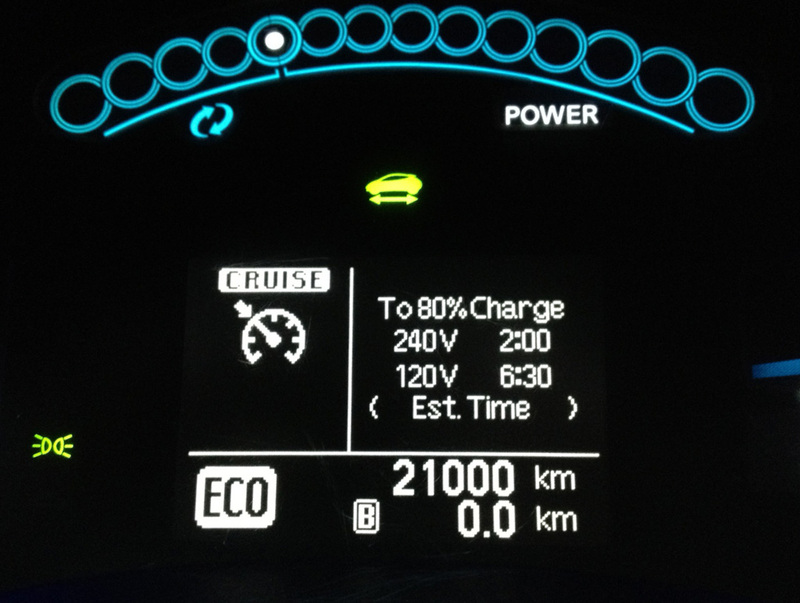 We hit 21,000 Km on the Leaf this month and it’s been almost a year since we first took delivery so I thought it would be a good time for a long due update. Overall it’s been a great journey, an incredible experience to be able to drive as much as half the Earth’s circumference without burning any fossil fuel. Not bad for a “range limited” car. So let’s look at the highlights of the experience so far, what went well and the few bumps along the way. The Leaf continues to perform like day one. According to the Leaf Range Chart, we’re supposed to have a 2% degradation in battery capacity after 15,000 Km, but that’s something still way to small to be noticeable, and I haven’t noticed any difference really. One of the most recent trips we did was a camping trip, carrying three people, camping gear, a roof rack and a cargo box. We drove 78 Km at speed limit (80 Km/h max) and arrived with 48% of charge left, giving an estimated full range of 162 Km. Temperature was 28 C but dry enough to go without A/C. On a second camping trip, under the same conditions but with A/C on, we drove 122 Km and arrived with 20% of charge left, giving an estimated total range of 152 Km. Our hydro bill has gone up $28 a month on average. That’s about half of a gas tank of a Corolla, our second car. The difference is that we drive an average of 1,800 Km a month, mostly in the city, about 1,500 Km more than the Corolla would be able to do with the same amount of money. In addition, 21,000 Km would require at least 2 oil changes, and the Leaf of course needed none. In total, we spent $326 in home electricity with the Leaf so far. At current gas and oil prices, driving the same distance with the Corolla would have cost us approximately $2,183, resulting in $1,857 of savings. If we add the savings with car insurance (yes, it is cheaper to insure an electric car than it is to insure a regular car), we have saved more than 5% of what we paid for the Leaf. That’s 5% of the full cost of the car recovered in just one year. Granted, these electricity costs don’t include the charging we’ve done away from home, which were all free. I trickle charge at work, at the Science Museum during our monthly EVCO meetings, and at camping sites when we travel. Most recently, a local shopping mall installed a Level 2 charging station, which is free for customers, and I’ve been there a couple of times. Finally, I also charged at the dealer a few times. 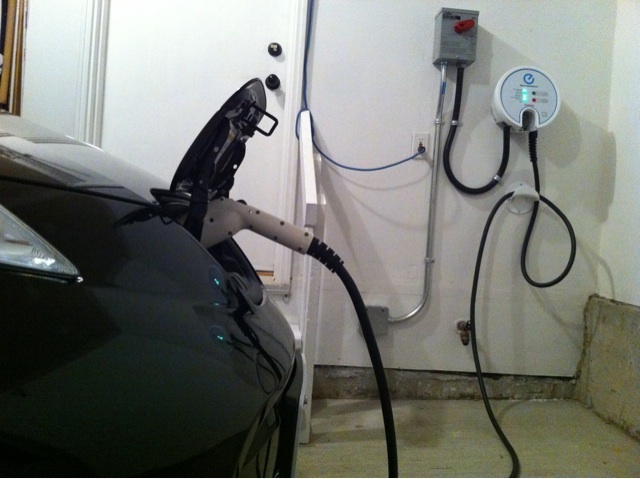 It’s very difficult to estimate how much it would cost if I had done *all* the charging at home, but reality is, electricity is available everywhere and it ends up being provided as a courtesy or as part of a service by businesses, and also as way for employers like IBM to promote the adoption of electric vehicles. I tell my friends at work that even if I tried to squeeze every single kWh from my employer (I don’t) all I would save would be $20 a month in home electricity. It’s just not worth the effort. I only charge to 80% at work, roughly 2 to 3 hours a day mid-peak. The electricity costs for my employer is equivalent to one Tim Hortons coffee a week! 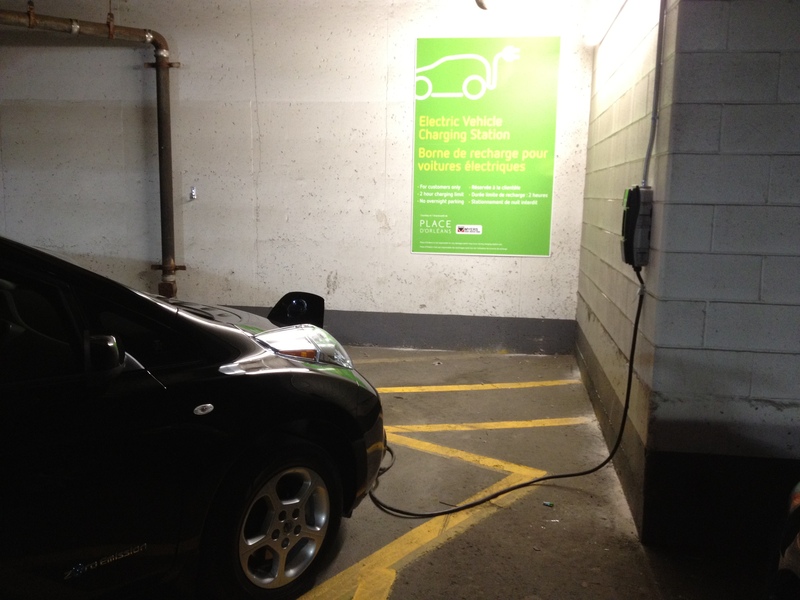 Since we received the Leaf, there have been two, only two public charging stations installed in Ottawa (Level 2 stations). One by a local shopping mall and another by a local college. That’s about it. Everything else are from dealers, with limited access to non-customers. This is a stark contrast with other municipalities like Montreal and Vancouver. Something really embarrassing for the National Capital. Ontario has also been very slow in developing any program to promote public charging stations, falling behind provinces like BC and Quebec. I was recently interviewed by the Ottawa Citizen about this subject and the article has just been published today. Not much to say about the AeroVironment home charging station other than it has just worked flawlessly. It is a very straight-forward device so it just sits there, doing its work every night, never letting me down. Our Leaf recharging at home. There were a couple of recalls and one software update but they were all optional and were able to be scheduled at our own convenience. I did spot one water leak in the trunk, most noticeable after a car wash, but that was also fixed quickly and without any costs. The only mechanical issue I had was when the parking brake woke up stuck at the ON position. The parking brake on the Leaf is electronic, with no physical cables between the parking brake handle and the electric actuator that does the real work. In my case, the light on the parking brake switch started to blink and an alarm started to flash on the display saying “visit dealer”, which wasn’t very helpful since I couldn’t move the car out of the garage. Fortunately Nissan designed an override system to release the parking brake manually, bypassing the electric actuator. The instructions are on the owner’s manual so I won’t go into much details here. After the procedure and I was able to move the car out of the garage and drive it myself to the dealer, despite the audio alarm on the dashboard saying I was driving with the parking brake on. The dealer had to order a new actuator from Toronto, which was shipped overnight. The part was replaced and the car was ready the next morning. Other than that, there has been absolutely no problem with the power train or anything else mechanic in the car. Carwings has been the only big disappointment of the whole experience so far. It started working well, I was able to review all the telemetry from the car, see the performance statistics, rankings, etc. After a few months the server became very unstable, constantly going down and people on the Leaf community in Canada started to get frustrated. We would constantly lose the ability to communicate with the car via the iPhone app. The problem was resolved after a lot of complaining, and people were happy again, except that our car would still lose connectivity once in a while. I was also getting gaps in my telemetry, until one day the car stopped sending data completely. It would still download information feeds like Google Maps but would not respond to queries from the iPhone app, send notifications about charging events or upload any telemetry. The issue went all the way to Japan. They collected and analyzed several logs and the conclusion was that they wanted to replace my TCU (Telematics Communication Unit) and have the original one sent to them for analysis. They sent one specialist from Toronto for the operation. They gave me a loaner car and I picked up the Leaf the next day. It felt like a brain transplant but the car was OK.
Carwings connectivity came back online a few hours later and I was able to communicate with the car again. Everything looked ok, emails worked again, until I noticed I was not getting emails for *all* notifications, only for some of them (charging complete events, for example, were never reported). After many back and forth emails with technical support, the problem is yet to be resolved. And things got worse recently when the car stopped uploading telemetry again. So Carwings has been kind of a nightmare. Nissan continues to assure me they’re looking into the issue as hard as they can but I’m yet to see a final resolution. I haven’t heard of any other Leaf owner having this problem so I think I was the lucky one. Range anxiety only lasted a couple of weeks. After I learned how to plan our day and our trips, and learned bit by bit what the car can and cannot do, it became really hard to get in a situation where I would run out of charge. It hasn’t happened to me yet, and I don’t think it will. The funniest story I got about range anxiety didn’t come from me but from a friend. We were going on the same car camping trip to a provincial park 120 Km away. 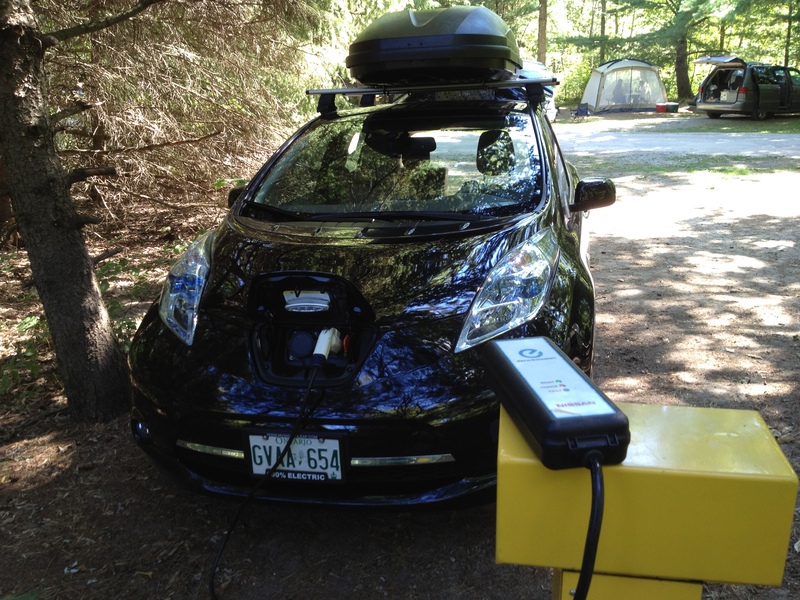 That was our second camping trip with the Leaf so I knew I would have enough range to spare. I knew I was going to take the shortest route, but not necessarily the fastest one, so I told my friend the day before that we could leave at different times so she could pick her own route and drive at her own pace (i.e., faster). The next day our friend called us saying she was concerned that we might run out of charge in the middle of the road so she wanted to go together and be there if we needed. 🙂 It took some convincing to explain we had enough charge for the trip and we finally hit the road in separate ways. Needless to say, we got there without any problems, with about 30 Km of range to spare. 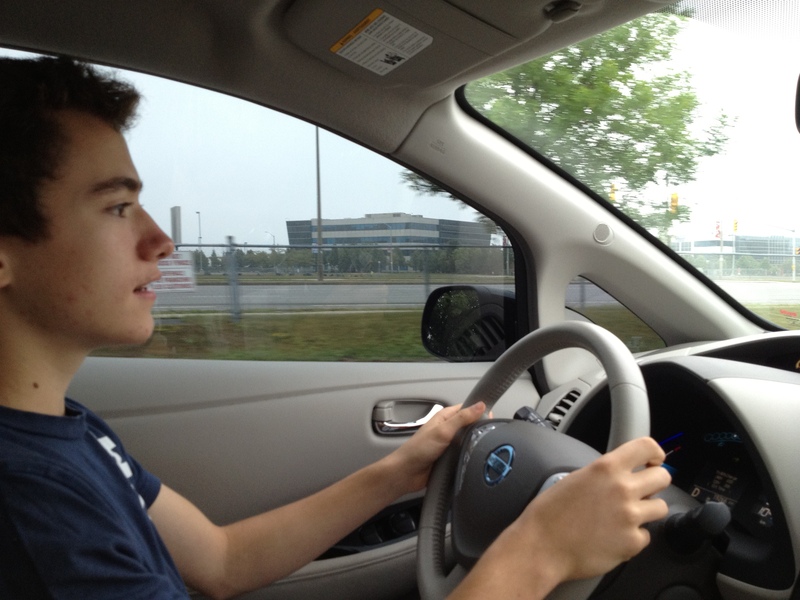 My son got his G1 driver’s license last month and took his first driving lesson on our Leaf. It was the first time he drove a car in his life, and it was an electric car. First driving lesson. No gasoline. One of the things I missed the most in the Leaf is a more accurate battery gauge, one that would show the exact percentage of battery charge. This is particularly important when you’re trying to measure your driving performance during long trips. The 12 bars are simply not precise enough and the dashboard range “guess-o-meter” is not totally reliable. I learned how to use a very convoluted way to estimate a more precise percentage, which involves reading the “120 V charge time” to figure out how much charge is left, but it only gives you a 2 to 4% precision and requires some calibration. Other Leaf drivers went out of the way and developed their own “SOC meter” device, plugged into the car diagnostics bus, but I was hoping Nissan would listen to those early adopters and provide the same functionality in a software update. That would be a very good move, to show that they’re listening. I’m surprised Nissan didn’t take the hint. What if I forget to plug it in? You know the feeling. You’re ready to go to work, grab your stuff, grab your phone, only to realize you forgot to recharge its battery overnight. Gone are the days when phones had replaceable batteries, so you’re stuck with a dead weight in your pocket. Folha is our car's name on CARWINGS. It means Leaf in Portuguese. It also sent me a text message, just in case. 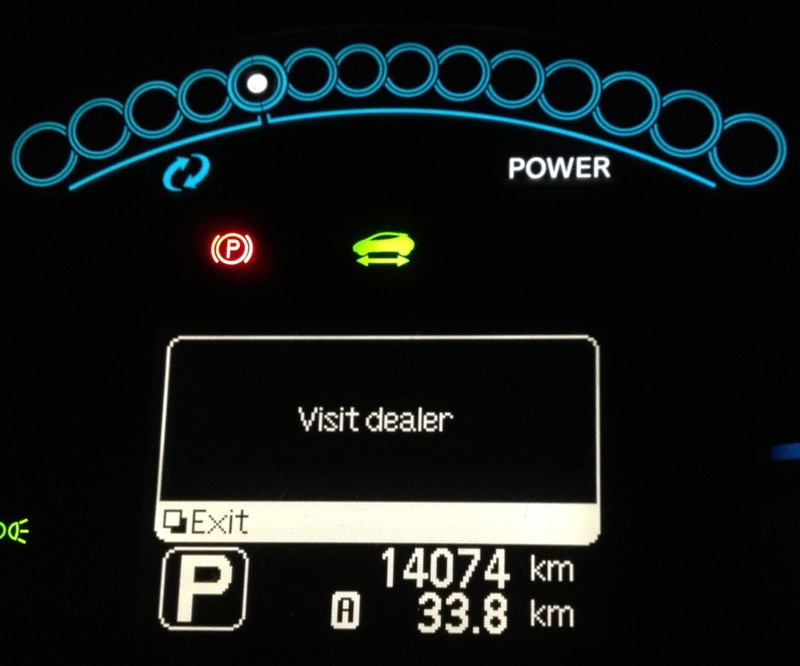 The Leaf can do this because it is equipped with a GPS and has its own 3G cellular connection. It also “remembers” it was able to charge at this location before and that I configured a timer saying it’s supposed to recharge every night. This is an awesome example of technology being used in a very smart way to solve a very common problem we have as humans: we forget stuff. The notifications are all configurable of course. I can tell the Leaf to send me just a text message or just an email, or both. I can also tell it to notify me if someone unplugged the car before the charge was completed. I can configure what hours of the day and what days of the week I want it to charge, in order to take advantage of cheaper off-peak rates. And I can tell it how much charge I want every night: 80% to save energy and prolong the lifetime of the battery, or 100% if I really need the full range.